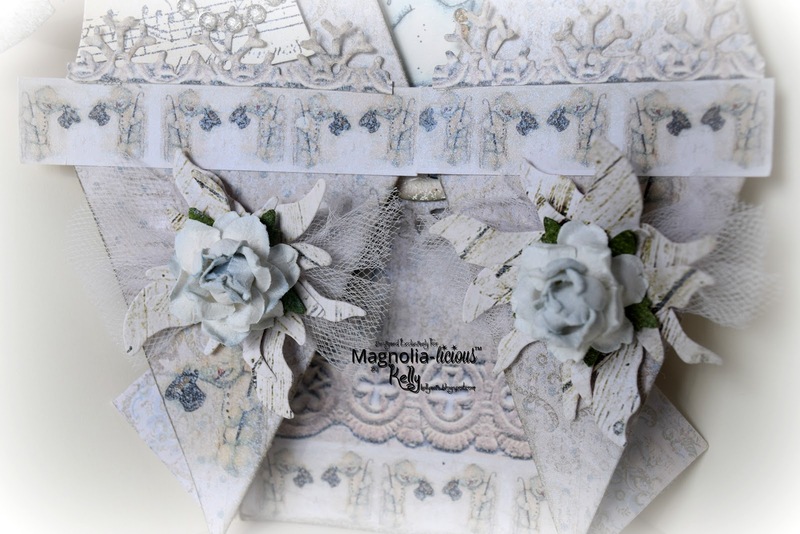 Magnolia-licious Challenge has a new theme FANCY FOLDS. I am not so good at making cards that require some math and perfect creases so this was a challenge for me. I chose the diamond double fold card template and I used only 1 12x12 piece of paper to make it. 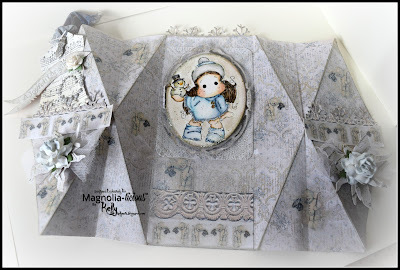 This is one of my favorite older Magnolia papers with the bowing snowman on it. It was pretty easy to make this card although the paper was thin so I almost tore it putting the folds together.I probably should have used another card stock but I wanted all the sides to be of this paper. My image is from the new Magnolia Collection A LOVELY CHRISTMAS and my image is Tilda with Little Snowy, they are colored in DI. I Frontaged it and edged with DI to give it more of a vintage look. The image is on a pretty see through doily card that I have, hard to see but you can tell towards the top. 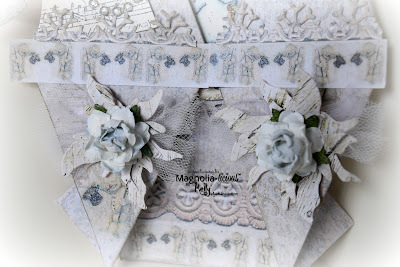 Here is my card all folded out, instead of a stamped image, you could put a message in the middle or a pocket for a tag, so many possibilities. 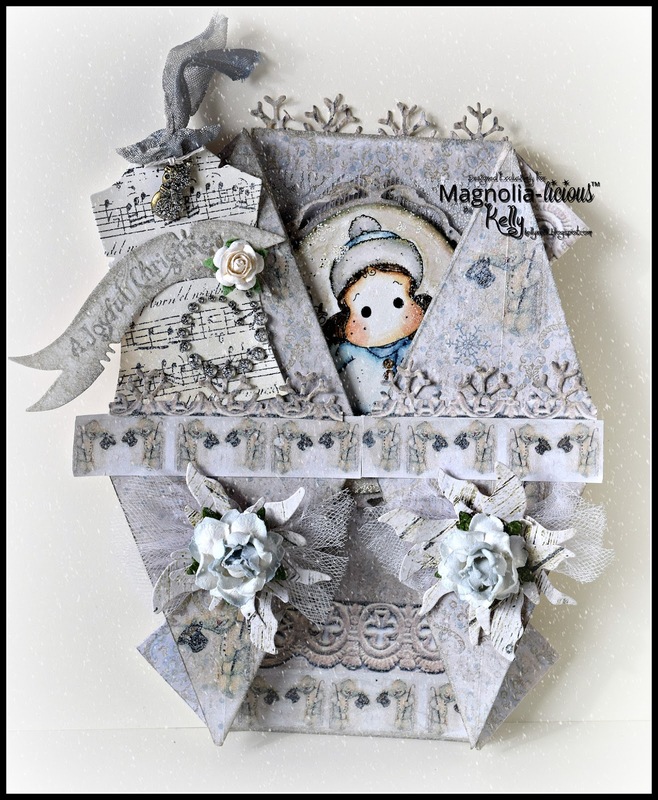 My embellishments on each side and the ribbon across is actually the paper edge and a snowflake die. The flowers are on doohickey dies poinsettia and tulle. 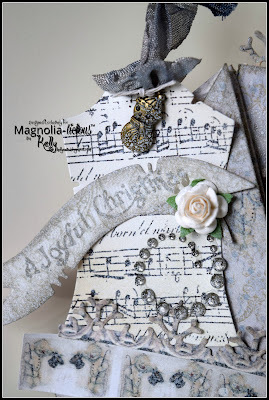 A tag, banner and A Joyful Christmas sentiment is also from Magnolia. 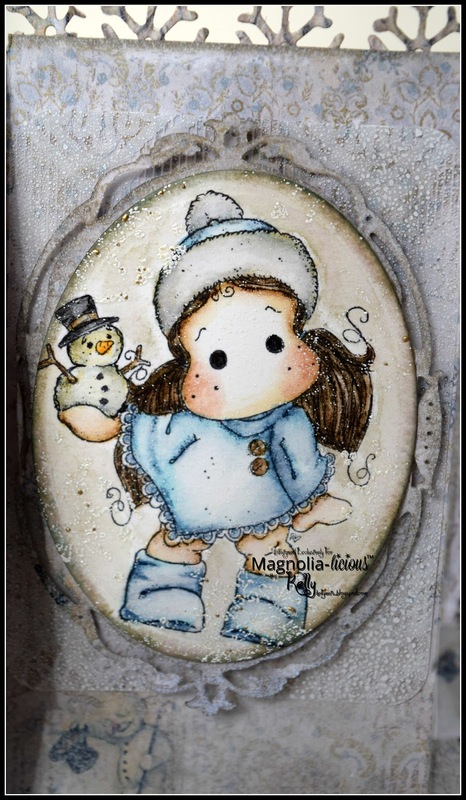 I gently sprayed this card with Prima Frost ink to give it a dusty snow look. Here it is a casual open card. There are variable templates for this card if you google Diamond double fold. 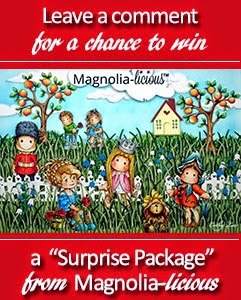 Please join our current challenge here at Magnolia-licious and show us your FANCY FOLDS! 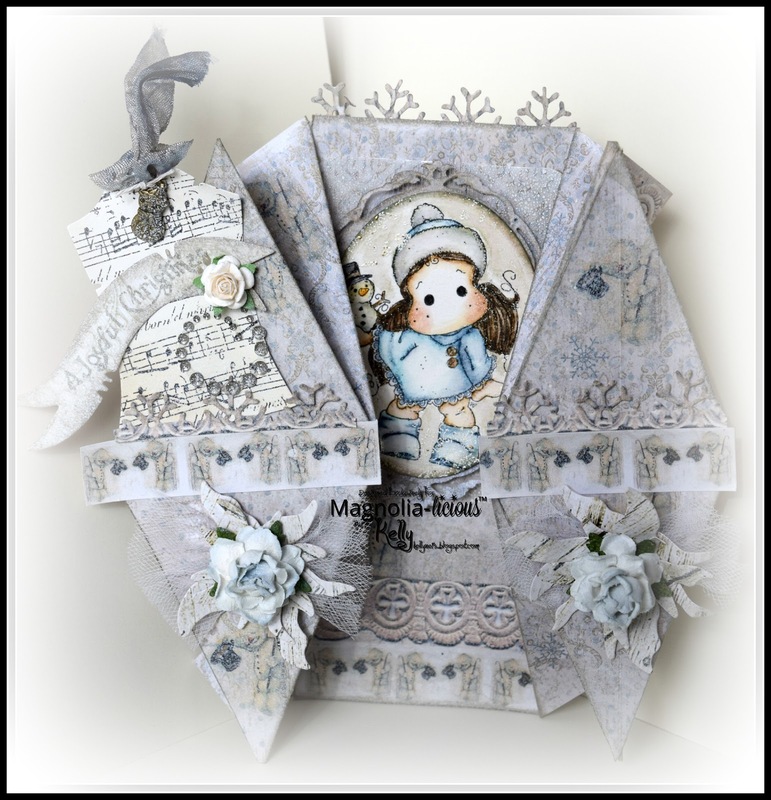 REMEMBER you will have more chances to win a prize if you comment on the other Design Team members blogs, you will also get more ideas on making some amazing cards. Wow ! superb and original creation ! Good grief a mighty...that is complex looking!!! It has such a classy appeal to it and rather 'castle' like with the peaks and edges. 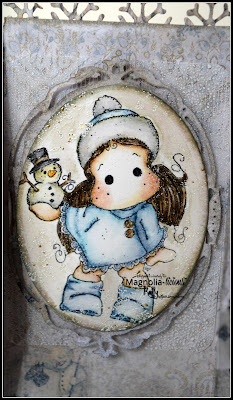 All of your wintry touches to it have created a gorgeous Christmas make. I love that there are so many ways to display it too. Even all the way open it's beautiful and intricate! Amazing intricate fancy folds, and there's a beautiful frosty feel about it. Fabulous work.